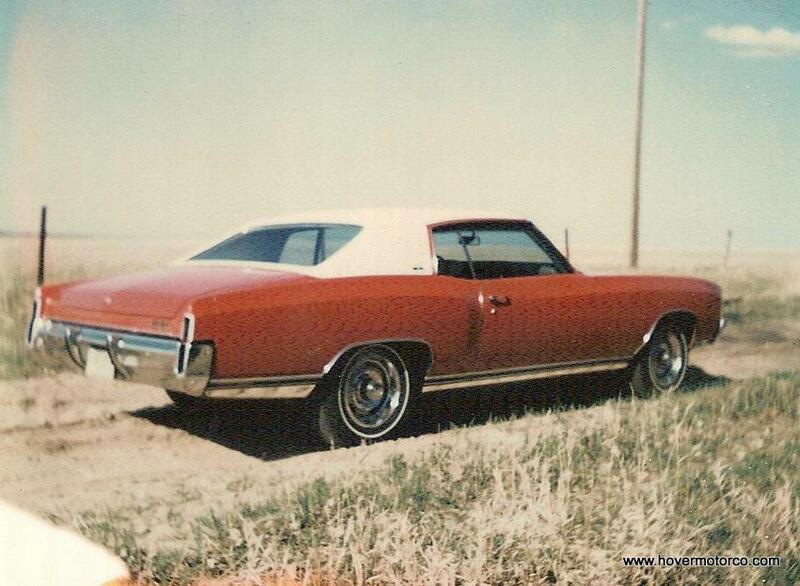 The first Monte Carlo was the Chevrolet version of the contemporary Pontiac Grand Prix, which came out a year earlier. It was essentially a Chevelle coupe built on a Chevelle four door chassis, which is why it had that lavishly long hood. Or, if you think about it another way, it was sort of a poor man’s Eldorado. It had a similar short trunk, long snout, formal roofline appearance without the astronomical price tag. The two door hardtop styling with full roll-down rear windows suggests that a convertible was also planned, but none were ever built from the factory. These were some of the best driving cars of their time. The engine was set way back in the chassis, and the weighted balance was excellent. No, it wasn’t a sports car, but it was an excellent touring car. And Chevrolet’s bullet-proof engine options included a 350-c.i. small block, a 402-c.i. big block, and of course, the 454-c.i. big block. There was just no way to go wrong with a first-generation Monte Carlo. By the way, the SS option was available in 1970 and ’71. In 1972, that changed to the Custom package. So if you see a 1972 Monte Carlo SS, you know something is a little wonky there. Here’s a little tidbit that I think is interesting. 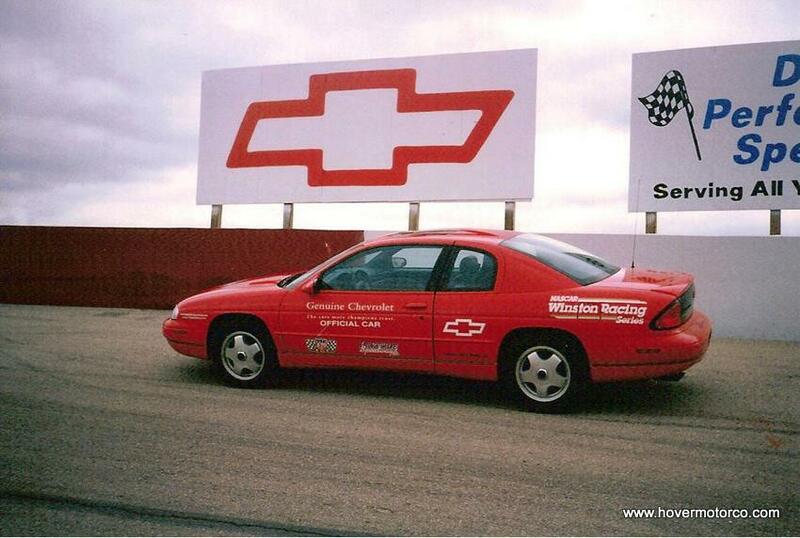 My dad was early in his career with Chevrolet Motor Division when the Monte Carlo arrived on the scene. One of his jobs was to travel around to auto shows and drive the Monte Carlo out on stage wearing a tuxedo while the dancing girls did their thing around him. And while he drove more Caprices than anything back then, he did drive a few Monte Carlos as company cars. The red one in this picture was one of his brand-new GM company cars. Wouldn’t that car be nice to have in that condition today? GM redesigned all of their intermediate cars in 1973, and the Monte Carlo was no exception. These were really ‘70s chic, with Landau half padded vinyl top options and long, sweeping body contours. Yeah, they were big and marshmallowey, and their V8 engines received all kinds of power-choking emissions equipment as the decade wore on, but they were still good driving cars, and tough as nails. It’s no secret that the cars of the ‘70s were prone to iron worms, but if you could keep the body on a Monte Carlo, it would run indefinitely. 1977 was the last year for this style of Monte Carlo. 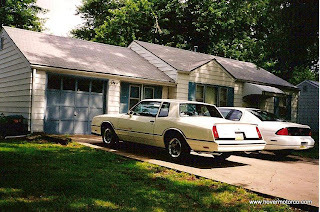 The full-sized Caprice had already been downsized for 1977, so the handwriting was on the wall. 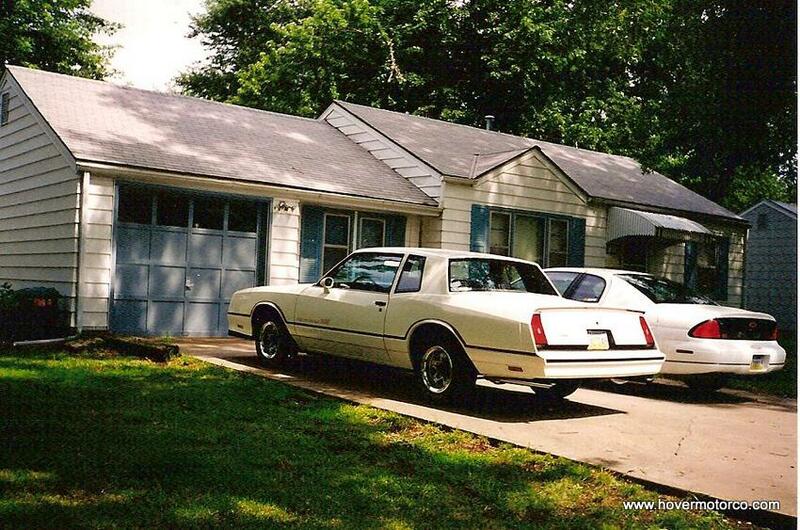 The crazy thing here is that the “intermediate” ’77 Monte Carlo was bigger than the “full-sized” ’77 Caprice. Chevrolet brought out a new, and extremely downsized version to help meet governmental CAFE requirements in 1978. People complained about the smaller cars across the board at GM, but it didn’t seem to stop them from buying them. The V6 and 305-c.i. V8 Monte Carlos from this era remained very popular either in spite of, or because of their relatively compact size. Another design refresh in 1981 paved the way for the NASCAR-inspired SS in 1983. Power and trim changes during this time kept the Monte Carlo fresh, and the Aerocoupe came along in 1986 to help the car compete with the sleek new Thunderbirds on the NASCAR Winston Cup Series. The last of this generation was a 1988 model. And though the Monte Carlo was gone, it was not forgotten. After a seven year hiatus, it returned in 1995. By then, it was still a two-door coupe, but now it was driven by the front wheels. And who are we kidding, really? These were Monte Carlos in name only. This car was a Lumina coupe. These weren’t bad cars, though. They might not have looked that exciting, but they had pretty nice build quality and lots of gadgets and features for that time. The final major redesign of the Monte Carlo came out in 2000. These were still front-drivers, but they did have some distinctly Monte Carloish traits that the previous versions lacked. The most obvious were the taillights, which mimicked those on the ’73-’77 and ’81-’87 versions. A new rendition of the knight’s shield emblem also returned after its ’95-’99 absence. And the sweeping wheel arches further embraced the car’s heritage. During this final hurrah, you could get this car in all sorts of racing-inspired special editions, including pace cars and NASCAR driver trims. The final Monte Carlo was produced in the 2007 model year. It’s hard to believe it has been gone for six years, but there you go. I have actually owned several of these cars over the years, spanning four different generations. And I liked every one of them for a different reason. But the thing they all had in common was that they were nice Chevrolet coupes, and they were often available when other car companies offered nothing even comparable. Will the Monte Carlo ever return? I wouldn’t put any money on it, but it would certainly be OK with me. The slideshow below has Monte Carlo pictures that I took at various car shows and events around town, as well as a few old personal photos. It should at least take you through the evolution of Chevrolet’s personal luxury coupe. Click on this link for a better version of the slideshow. You traded a '76 Monte Carlo for an early '80s Corolla? That had to hurt! Thanks for the story, Rick. When I worked at Leeds Plant in 78 the Monte's were built there along with 2 door / 4 door / SW Malibu's, El Camino's, & GMC Sprint. You should do some stories on the great cars that came out of Leeds, Fairfax, & Claycomo plants. You know, that is a good idea. I might have to do that sometime! Thanks, spammer! I barely understand that, but I'll take it as a computer-generated compliment! always liked the monte carlos. closest i came was owning a '74 Chevelle SS Laguna with a 454, and finally got one of the newer generation monte's buying an '03 SS in 2005. very hard to find superior blue with tan leather. still like the styling on those. 75 creme colored monte was my 2nd car -- (69 bug was first). My grandmother bought it brand new, I got it in about 1980. Ended up with a cam and headers, and I learned how to do transmissions with that car. (I was rather hard on vehicles...) Did the trans 5 times, rear end twice, and went through the engine once. I owned it 3 years and sold it to buy a gorgeous 79 firebird esprit -- I should have kept the monte. I miss that car, and will have another when my wife's 84 454 monte is completed (hopefully driving this summer) got the drivetrain installed, just finished making the factory ac box clear the valve cover, have to get pulleys, then put the interior back together and paint, then we are gonna cruise Route 66 with my 15 year old all the way from Kansas to Cali. I own a 70 Monte, 350/4barrel. Red, black top/interior, bench, auto. Love this car. I've been after it since I was probably 6 years old. Story goes that my dad bought in 71/72. He and his first wife drove it for several years. My uncle bought it from them, drove it until it didn't run and parked it for a couple years. Then my brother bought it from him. Went through the motor, gave it a repaint and a new vinyl top. Almost immediately after that he joined the USAF(1988) and it was stored in our garage, being driven in a few parades here and there. I finally convinced him to sell it to me in 2011 after years and years of harassment lol. Stipulations are that if its ever sold that it be to someone in our family... I had absolutely no problem with that. Its going no where. Montes will always be my favorite cars because of this gorgeous automobile. i've had 5 MCs with the 1st one being the best. in early Sept. '75 i ordered a new '76 Monte Carlo in dark blue with a silver blue vinyl landau top and a white vinyl bucket seat interior and with almost every possible option. i think the window sticker was about $6600. i got the car in late Oct or early Nov and drove it a little until winter set in, then i put in the garage and bought a $200 winter beater car-remember those days? when spring broke, out of the garage it came and i added Hurst T-Tops and a set of Tru Spokes and BFGs. I drove it until Sept '76 when i sold it for $6400 to get married- dumb move, got divorced in early '79. in late '78 i traded a '68 Camaro even up for a '74 MC because wife didn't drive a stick. after that i owned one of each year 1st gen MCs including a silver/black '71 SS454 that i put a 5 speed manual into. my 2 favorite cars were the '76 and '71 MCs. Thanks for the post, I love monte carlo. I guess I never saw an amazing design and coolest car ever. I found a 2001 SS with under 150,000 mi. for sale for $3,000 OBO. What questions should I ask and what problems should I look for? The price seems almost too good to be true. I'm also a big fan. Owned a '73, 79, 86 & 87 SS. My son's first car was an '04 SS. They were all good to me! So i own a 84 monte ss is that considered a 4th gen monte? When I was 5 years old, my mother bought a 1976 ( I believe) black Monte Carlo with T-tops . As a kid , I had no ideal how cool that was ! Someone pulled in front of us and the Monte was totaled ��. I fell in love with the Monte Carlo as a young teen the first time I saw one on the NASCAR track in the 80's. I've had at least one incarnation of a Monte Carlo in my possession ever since I was of driving age. I always loved the styling of the 1st and 4th generations the best and I have a '72 and an '85 SS model in my garage right now. Great cars! I've owned 4 Monte Carlo cars over the years. '78, '81, '85' 05. I loved each of them! For some reason this car feels right and suits my personality. It is unfortunate coupes have lost popularity. I think these cars are some of the best driving, comfortable and long lasting products. They are beautiful also! I still get looks in my sport metallic Red '05!! As with all things, the market drives the product. So if people wants coupes, it just might return!